A new study titled “Bisphosphonate Use and Atypical Fractures of the Femoral Shaft” published in the May 2011 issue of the New England Journal of Medicines further strengthens the claim that bisphosphonates, like Fosamax, may increase the risk of atypical thigh bone breaks. This is the 4th study from the publication which favorably promotes the mounting litigation against the drug’s manufacturer Merck for allegedly producing a defective and harmful drug, ultimately providing Parilman Fosamax Femur Fracture lawyers with more fuel to obtain justice for patients harmed by defective drugs. The newest published investigation, conducted by Swedish researchers,examined data from 12,777 women ages 55 or older who sustained a femur fracture in 2008. Out of the 12,777 participants, 1,271 patients who suffered a subtrochanteric or diaphyseal fracture were identified. From the 1,271 injured women, x-rays for 1,234 patients were obtained. After looking at the x-rays, researchers identified 59 women who suffered atypical femur fractures; 46 of the 59 affected women had taken a bisphosphonate such as Fosamax. That’s nearly 78%!! Many experts are now praising the research for being the most comprehensive study regarding Fosamax Femur Fractures. The accolades are attributed to the large population of women studied and the scrupulous review of nearly all atypical femur fracture x-rays. These research results indicate a consistency with other studies that established a link between bisphosphonates and femur fractures from seemingly mundane low-energy activities such as walking and standing. This risk for thigh fractures can diminish by 70% per year when patients stop taking bisphosphonates; resultantly, medical experts continue to investigate how patients can safely be treated with bisphosphonates long-term (5 years +). Fosamax users please know that a low absolute risk for atypical femur fractures does NOT imply that there is no risk. 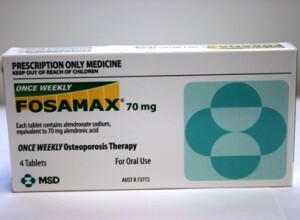 The Fosamax Femur Fracture experts of Parilman and Associates are excited about the latest developments that help fortify the assertion that Merck failed to properly warn consumers of the medication’s side effects. If you took Fosamax and suffered adverse side effects, call the lawyers of Parilman and Associates at 1-800-391-8000 immediately for a free case review. This entry was posted in Blog and tagged adverse side effects, adverse side effects lawyers, fosamax lawyers, Parilman and Associates. Bookmark the permalink.